HP has been the subject of many headlines over the last few days as folks attempt to unravel the many questions surrounding the mega-vendor's decision to halt its webOS projects and potentially exit the PC market. The former initiative is well underway as HP immediately began dumping its existing TouchPad supply, offering the 16GB and 32GB tablets for only $99 and $149. The fire sale will continue this week via retailers and, if nothing else, has allowed the previously ill-received device to enjoy a moment in the spotlight. According to Amazon's statistics, the 16GB iteration has become the e-tailer's top selling electronic, followed by the 32GB unit. Unfortunately, finding the deeply discounted units has become extremely difficult and Amazon itself doesn't seem to be offering any devices. Instead, various third-party merchants -- who presumably purchased the discounted tablets in bulk -- are reselling the Touchpad with a markup. The 16GB model is fetching $229.99 all the way north of $400, while the 32GB device starts at $399 with free shipping. The decision to terminate its mobile ventures will reportedly have a strong impact on HP's Taiwanese hardware production partners. According to inside sources cited by DigiTimes, the company's webOS partners will clear existing inventories and plan to cease sales as soon as possible. 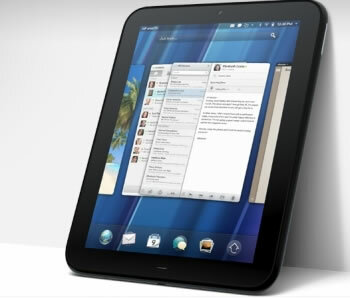 HP's upcoming webOS smartphones were being produced by Foxconn and Compal Communications, while the TouchPad was being assembled by Invetec. All three outfits will be forced to adjust their production lines in light of recent events. Although the move is still undecided, some analysts are concerned about the consequences of HP departing from the PC business. For instance, it's suggested that Samsung is the most likely to acquire HP's PC business because other players lack the funds and supposedly have conflicting strategies. HP's PC business accounted for $40.7 billion in revenue in the last fiscal year, so it surely won't be easy to sell. A Samsung acquisition would affect the supply chain as the manufacturer tends to produce things in-house. Again, HP hasn't confirmed that it will exit the PC market, only that it's contemplating the possibility. That said, such a large, publicly traded brand simply wouldn't announce something of that magnitude if it didn't already have a battle plan. Following only one day after the announcement, HP's stock price sank by 20%. Regardless of its true intentions, Michael Dell has seized the opportunity to sling some mud at his longtime adversary in a four-day escapade on Twitter. HP has responded to at least one of Dell's jabs.